We visited Grange-Over-Sands whilst on holiday in the Lake district, staying at the nearby Haven Lakeside caravan site. The problem is that, whilst generally I think the guide is really good, it was published in 1996, and a lot has changed since then. Reading the entry for nearby Flookburgh (where the Haven Lakeside Caravan Site is) gives a clue to what has happened. 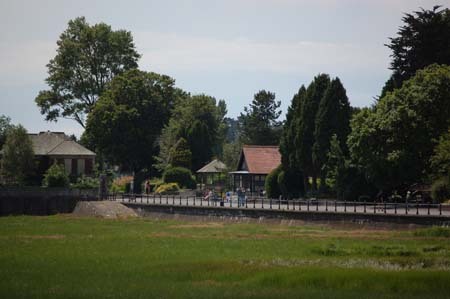 This appears to be what has happened at Grange-Over-Sands as although the promenade still exists, it is now alongside grazing land, with the sea out in the distance. Apparently in the late 90s there was a growth of spartina grass which by the early 2000s had turned the beach into a saltmarsh, now used as grazing land for sheep. You can still see the sea in the distance, but the sand is now grassed over and the children’s amusements have all gone. It’s actually quite interesting to take a walk along the promenade and see the sea wall. However rather than being a fun seaside resort it’s more of a curiosity than a beach. Despite the lack of sea grange-over-sands is still a nice place, it’s just not the seaside resort that we expected. There is the promenade from which it’s supposed to be possible to see Blackpool tower, although I couldn’t see it despite wasting 20p in the telescope and using my camera on it’s telephoto setting. There are still a couple of small cafes and ice cream sellers although the swimming pool / Lido is all closed down. There are nice gardens and a duck pond and all in all it’s quite a nice place. However the tourist business appears to have left when the beach did and it’s not the seaside resort we expected. I’m sure that there are things that could have been done to keep some of the tourism including a giant sandpit and paddling pool, but there is now so little left of the tourism it’s probably not worth trying to resurrect it. A nice place to visit for an hour or two but not a seaside resort! Most of the websites for Grange-over-Sands gloss over the lack of sea or beach. 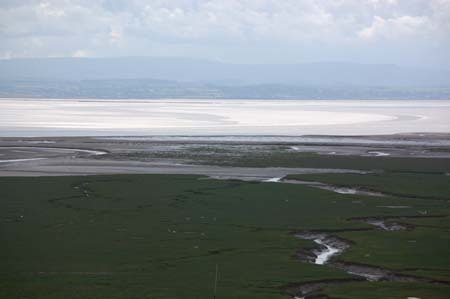 One even goes as far as to call Grange-over-Sands a “picturesque seaside town”. There is however a good Wikipedia entry on Grange-over-Sands. This entry was posted on Tuesday, September 4th, 2007 and is filed under Babies, Children, Holiday, Tourism. You can follow any responses to this entry through the RSS 2.0 feed. Both comments and pings are currently closed.